With long daylight hours and bright sunshine (albeit perhaps only occasionally in a British summer), it’s time to think about those sunnies. It’s important to make sure that your eyes are adequately protected when you step outside. Gradient lenses are tinted top down, with the top of the lens being the darkest. These are great for driving as they shield your eyes from overhead sunlight, and the lighter bottom half of the lens can help you see your dashboard. However, they are not always as dark as other types of tint and are often chosen more for cosmetic reasons. Double gradient lenses are darker on the top and bottom, with a lighter tint in the middle band. These are useful on the beach, where they protect your eyes from the sunlight reflecting up off the water and sand, although again they are not always as dark as other tints. Photochromic lenses adjust their level of darkness according to the amount of UV light they are exposed to. The downside of these is they tend to go dark even on cloudy days as they react to the UV, but won’t change in the car. Coloured lenses impact colour perception. Grey & brown lenses provide the least colour distortion, yellow lenses are popular with skiers whilst green is favoured by golfers. The big advantage of coloured lenses is that they provide heightened contrast and sharper focus in overcast or low light conditions which is useful in sports such as tennis or cycling. Polarised lenses cut reflected glare and let you see into water, so they’re useful to those who swim or play water sports. They’re also useful for drivers as they can cut reflected glare from roads. Mirror coated lenses have highly reflective coatings applied to the surface of the lenses to reduce the amount of light entering the eye. These are helpful when you’re in exceptionally bright conditions, for example skiing on a sunny day. Once you have decided which lenses suit you and your lifestyle best, keep these other tips in mind while picking a new pair of sunglasses. Sunglasses must be CE-marked, or there is no guarantee of their UV protection. Make sure that your sunglasses blocks at least 99% of UVB rays and at least 95% of UVA rays; anything less than that is just cosmetic. Try on the sunglasses to make sure that they fit properly. They should not pinch around your head and your eyelashes shouldn’t touch the frame or lenses. Some of the best material for sunglasses lenses is polycarbonate. These lenses are impact-resistant and also have great optical clarity. Pick a pair that suits the shape of your face, because not all styles suit all faces. 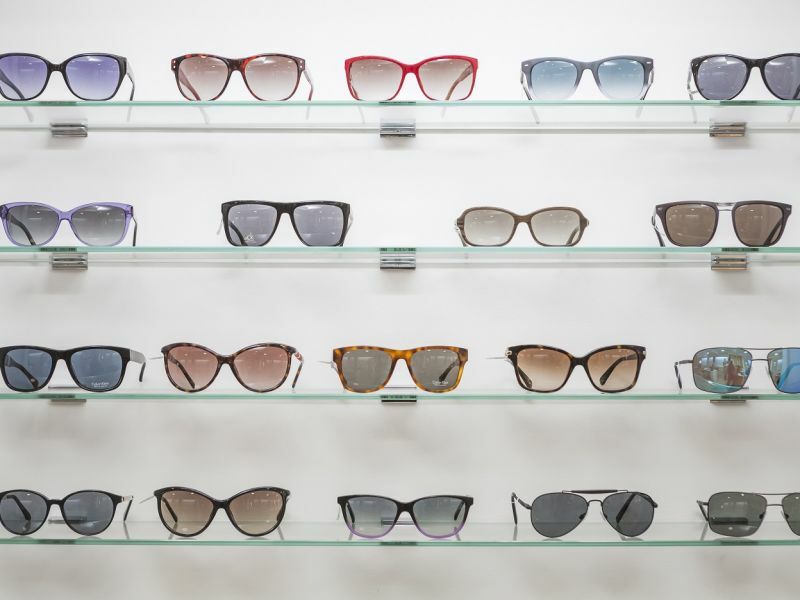 If you’re looking for new sunglasses this summer, pop into your local Leightons Opticians & Hearing Care branch and choose from our wide range of great-looking sunglasses. We have some fantastic brands on offer such as Maui Jim, Ray-Ban, Oakley and more. As well as choosing the lenses that offer the best protection for you, you should try on frames to find some that suit the shape of your face. For example, Ray-Ban’s Aviators will balance out a heart-shaped face. If you’re blessed with an oval face, most styles will suit you, so take your pick! While you’re at the branch, why not book an eye exam as well? Should your eye exam suggest that you need prescription lenses for your sunglasses, we can customise your chosen designer frames with the appropriate lens prescription. Just call us on 0800 40 20 20 or book an appointment online.